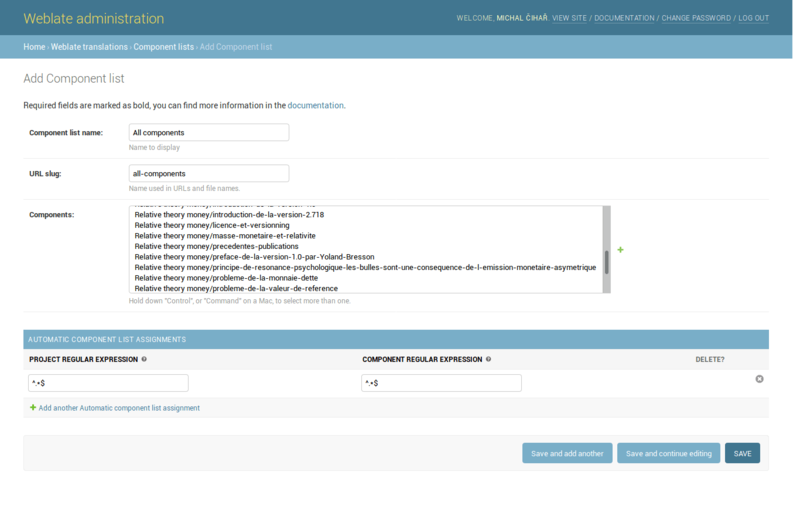 Weblate allows you to specify multiple lists of components. These will then appear as options on the user dashboard, and users can pick a list to be their default view when they log in. See Dashboard to learn more about this feature. The names and contents of component lists can be specified in the admin interface, in Component lists section. Each component list must have a name that is displayed to the user, and a slug that represents it in the URL. Since version 2.13 you can also change the dashboard settings for the anonymous user in the admin interface, this will change what dashboard is visible to unauthenticated users. Additionally you can create Automatic component list assignment rules to automatically add components to the list based on their slug. This can be useful for maintaining component lists for large installations or in case you want to have component list with all components on your Weblate installation.